Kris Meeke says he is happy with the new three-year deal he has secured with Citroen which will see him test and compete for the French manufacturer. 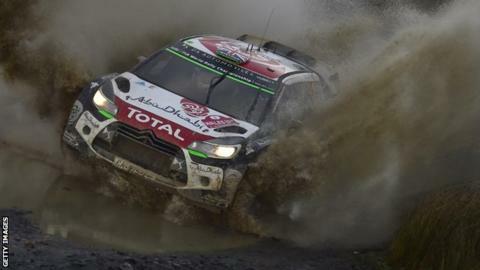 The 36-year-old will take in just six to eight rounds of the 2016 World Rally Championship as he develops a new car. Meeke will compete the full series in 2017 and 2018 under new regulations. "To obtain a long-term commitment off a big manufacturer who will re-double their efforts to fight for the title is what I've always wanted," said Meeke. "I had a good run of results near the end of the season, which left me in a reasonably strong position, but it took a bit of time to come to an agreement that really suited Citroen and myself. "We achieved our goals for the season by winning a rally in Argentina and taking second place in the Manufacturers' Championship, although personally I believe my runner-up place in Rally Great Britain was probably my strongest performance of the season." The Dungannon driver expects an "intensive" period of testing next year ahead of a full assault on the world championship in 2017. "The cars have to be built to new regulations for 2017 and while the car is already being developed, it will take a lot of time to work on the project - it will be a long, intensive process. "The events we do in 2016 will be to keep sharp. You need to keep your hand in and be able to compete to keep your level up. "The main focus for me is on 2017 and 2018 but 2016 is where all the hard work and preparation will go in to help us achieve success later on."